The Hyundai Santa Fe is the ideal SUV for any family. Getting the used model will save you a lot of money which seems to be important during tough economic times. The Santa Fe comes packed with all sorts of standard and optional features. It has lots of passenger as well as cargo space. Come in and check out the used Santa Fe models we have available at Butler Hyundai where you'll be able to test drive and pick the one you like most. Several trims and colors are available for you to choose from and we are sure your choice will be the most ideal and suitable for your needs. 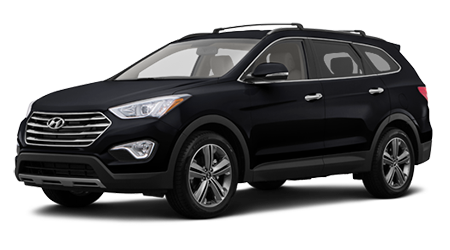 Getting financed for your used Hyundai Santa Fe is pretty quick and easy at Butler Hyundai. Our staff will help you through the process and make sure you end up with the best and affordable monthly payments. We'd like to earn the business of all Hyundai shoppers satisfactorily serve your needs during the purchase of your used car. The used Santa Fe is the ideal choice of SUV for families that drive their kids around to and from after school activities. The perfect size of it and having enough room for everything gives drivers more compatibility and convenience.